Presidential elections are always gold mines of comedy riches for the writers of "Saturday Night Live," but this year’s Trump-led pack must be like a dream. "SNL" has a long history of making politicians into recognizable caricatures whose foibles and follies are played up for laughs. This election season, the heavy comedic lifting has already been done by the candidates themselves. To welcome the show's 41st season, here’s a look at some of the best political sketches featured in its more than four decades on air. There are plenty more where these came from, but among the list that follows are 11 moments both classic and overlooked, chosen from both the early days of "SNL" and more recent seasons. 1. Palin-Hillary Press Conference, 2008. The instant Sarah Palin appeared on the political scene, with her "Aw, shucks" style and word salad interview answers, she was destined for comedic roasting. Tina Fey had already departed "SNL" for "30 Rock," but she so thoroughly looked the part that it only made sense for her to return and take on the role. Though she only appeared as Palin in a handful of skits, they remain among the most memorable — and widely watched — political sketches in the show’s history, and researchers claim a little thing called “The Fey Effect” may have helped keep McCain out of the White House. While this sketch mocking Palin’s famously poor showing during an interview with Katie Couric is equally hilarious, the skit below edged it out thanks to the presence of the now iconic misquote, “I can see Russia from my house." 2. Ronald Reagan: Mastermind, 1986. 3. A Message from President Gerald Ford, 1976. Chevy Chase — an "SNL" cast member only for its inaugural season — portrayed Gerald Ford as a bumbling klutz who spent most of his time falling down and being confused by relatively easy concepts. In this sketch, Chase’s Ford mucks up a call between Kissinger and Anwar Sadat, mistakes a cup of water for a telephone and effectively ends up, as always, in a heap on the floor. 4. George H.W. Bush Gives Debate Advice to George W. Bush, 2000. Two of "SNL’s" most iconic Bushes — Dana Carvey as George Sr. and Will Ferrell as George Jr. — appear in this sketch in which a short-tempered 41 attempts to educate his son on how to handle himself in a presidential debate. Even by 2000, Ferrell had perfected the image of Bush he would go on popularize — a goofy, earnest, dimwitted frat boy oblivious to how far in over his head he is. Every four years, in the weeks before the general election, the media and pollsters spend an inordinate amount of time talking with “undecided voters.” You know who I'm talking about: those who claim they haven’t yet made up their minds despite vast amounts of available information explaining the polar opposite platforms of the two candidates. In late September 2012, "SNL" parodied these holdouts, highlighting the kind of questions that might remain for someone who could possibly still be on the fence so late in the game. Questions like "When is the election?" "What are the names of the two people running?" and "Who is the president right now?" 6. Ask President Carter, 1977. Jimmy Carter: A man so of-the-people that "SNL" depicted him as prepared to talk a postal worker through the steps required to use an automated letter-sorting machine and able to help a teenager mellow out during a bad acid trip. “You did some ‘orange sunshine,’ Peter,” Carter, played as unflappably cool by a very young Dan Aykroyd, tells the young caller. “Relax, stay inside and listen to some music, OK? Do you have any Allman Brothers?” Bill Murray as Walter Cronkite also features prominently. 7. James Carville on the Tea Party, 2010. 8. 2012 Town Hall Debate: Obama vs. Romney. Barack Obama (Jay Pharoah) and Mitt Romney (Jason Sudeikis) duke it out — figuratively and, at moments, very nearly literally — in "SNL’s" take on the contentious 2012 second presidential debate. The show also took a few comedic jabs at the town hall’s audience of “82 undecided voters from the Long Island area,” with Candy Crowley (Aidy Bryant) suggesting questions were “selected based on the severity of their accents.” Tom Hanks shows up in a cameo that provides one of the skit’s biggest laughs. 9. Clinton Visits McDonald’s, 1992. In a 1992 piece on the eating habits of Bill Clinton, the New York Times wrote that the president-elect was engaged in a “battle of the bulge” largely resulting from a love of fast food and visits to his hometown “fat factories.” In this classic "SNL" sketch, Phil Hartman's Clinton explains foreign policy through mouthfuls of other people’s McDonald’s. (At one point, Hartman has so much food in his mouth he nearly breaks into a fit of laughter.) Chris Rock, a cast member for three seasons, appears briefly at the start of the sketch. 10. Dad and Son Go Hunting, 2000. Another skit pairing Dana Carvey and Will Ferrell as junior and senior Bush. This time, the two are on a hunting trip in the woods, where Bush 41 tries to have a serious conversation with his son about the enormity of the task before him. Predictably, it does not work out well. 11. Al Gore Visits The West Wing, 2002. One of my favorite "SNL" skits of all time, political or otherwise. 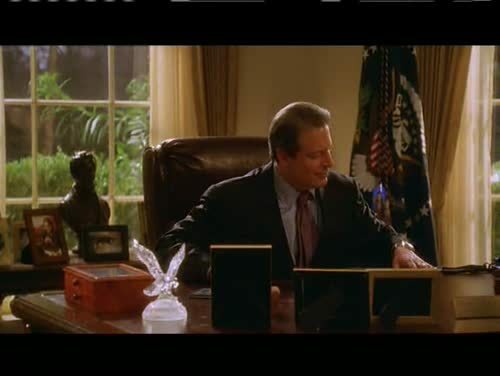 Al Gore, on a tour of the set of "The West Wing," gets a little too comfortable sitting at the president’s desk and pretending to be the Commander-in-Chief. The writing here is brilliant, the cameos (Martin Sheen, Allison Janney, John Spencer, Bradley Whitford and Richard Schiff all appear) are great and the acting is fantastic. Extra kudos to Al Gore for so gamely playing along with the whole thing.